Yesterday on Twitter, Arwen asked, “How will you change energies today?” I find myself thinking of her question as I look at the cards I drew today: reversed Ace of Swords and reversed Two of Wands. These cards are dripping with the need to change energies! We need to find a way to reverse them. Because here’s what I see in the reversed Ace of Swords: negative thoughts. Thoughts that we point towards ourselves and cut with. Negativations (is that the opposite of affirmations?). The beginning of a kind of day that we don’t need, a day of jonesing, a day of depression, a day of anxiety, a day of stress and worry. A day of getting down on ourselves, a day of getting down on others. All of this, we don’t need. Why don’t we need it? 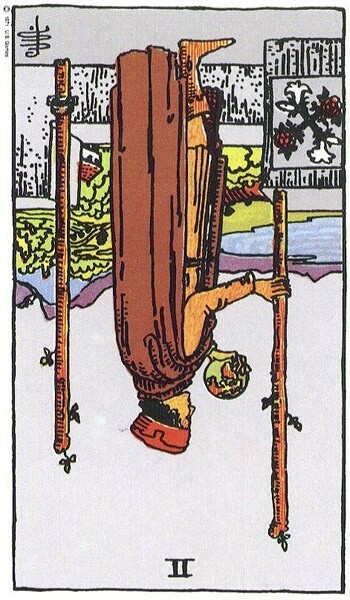 Because all this negative thinking and negative energy is hampering our ability to make healthy well-informed carefully-thought-out Two of Wands choices, that’s why! We are ready to use our brains and our creative energy, our Kundalini energy (like I really know what that is! but it is what it is and it fires us up), to make plans and go out into the world and manifest those plans. But instead, all that fire and energy has been totally stopped short by negativity. This energy, yes, we have to change. We have to turn these cards right side up and get thoughts and creative energy working for us, not against us. How? The answer is in these cards. 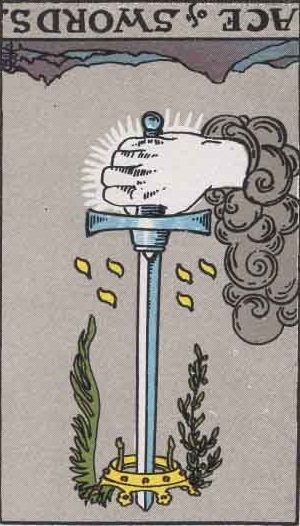 Those negativations in the reversed Ace of Swords need to be replaced with affirmations. You know what affirmations are, so make some up that are appropriate to you and say them to yourself in place of the negativations. Second, ground, ground, ground. See how the sword is pointing down at the ground? It’s saying, release the negativity, the worry, the stress, into the earth. The earth knows how to neutralize it. It’s good at that. Release it all. Send your own roots into the ground and grow up from there, like a plant. Be still and slow and patient like a plant about it. The stillness and the grounding will fill you with enough positive grounded energy that the all over the place nerves and spikes of negative angry energy will subside and calm down — like a fire that someone just threw dirt over. Throw dirt over your own negativity and feel the relief as your personal electrical system calms down. Keep drawing that grounding, neutralizing energy up from the earth through your roots, so that the negative energy of others is naturally neutralized as it gets close to you. This can be done.